On the surface Samsung’s new Galaxy Note 2 smartphone powered by Android 4.1 Jellybean looks like an evolutionary change from the Note but several key changes under the hood make it a worthwhile upgrade. When it was first launched, the Samsung Galaxy Note’s large screen surprised everyone. Some claimed that the Android smartphone was too big to be a phone and too small to be a tablet. To the surprise of everyone the Note and Note 2 have sold far better than expected. Many technology pundits and analysts predicted that it would have only niche appeal but the Note and Note 2 have proven popular with men and women alike. To date, well over 15 million units have been sold worldwide. These numbers boosted the recent Q4 2012 pre-earnings guidance for Samsung Electronics which showed a healthy increase year on year in sales up 10.3% and profit up 72.96%. During a recent trip to Hong Kong business two business women told us that their iPad’s were too big to carry around out of the office and the iPad mini was not a phone so the Note II was perfect for their needs as a combined phone and mini tablet. When queried about its size they said they stored it in their handbag where it didn’t take up much space. 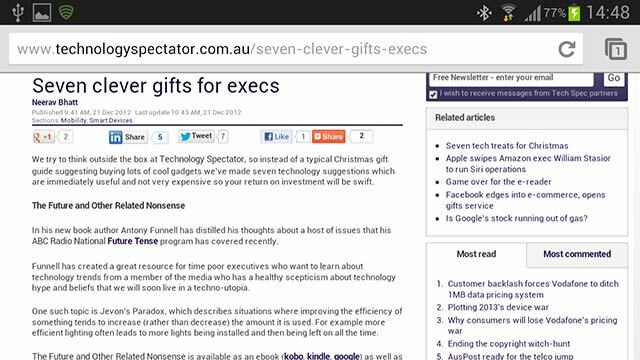 One obvious differentiating factor that explains the Note 2’s popularity is its 5.5” Super AMOLED capacitive touchscreen, with a high resolution (720×1280 pixels) that allows lots of information to be displayed: whether it’s reading long emails, word documents or Business Spectator articles. Huawei announced at the recent CES trade show that their new Ascend Mate would have a 6.1” screen size, making it the largest phablet on the market to date. We draw the line for a phone/tablet hybrid aka “phablet” that is still practical to use while on the move at the Note 2’s 5.5” screen size. The Note 2’s screen is 0.2” larger than the original Note, slightly taller and a few mm less in width which make it exactly 16:9 ratio. This ratio means the Note 2 is perfect for watching video which is usually in 16:9 format and doing so will be easier than before as Samsung has enabled native support for extra file formats like MKV. An unexpected improvement which is especially handy for business people who are out of office or travelling a lot is the Note 2’s very large 3100mAh battery capacity (600mAh more the Note), which allows it to be used quite heavily all day and still have plenty of charge left in the evening. Another unique differentiator is the S-Pen stylus which slots into the back of the phone. This stylus in theory allows a user to create handwritten memos on the Note, draw conceptual designs and even sketch ideas. Your experience with the stylus will vary depending on how good you are at writing and drawing, it won’t give you a designer’s ability or imagination. Readers in urban areas will be familiar with the frustrating regularity at which the networks of Australia’s triumvirate of mobile carriers Telstra, Optus and Vodafone suffer from 3G data congestion. From cities like Melbourne to regional towns like Merimbula this issue is getting more commonplace. At present the only way to to try and avoid congestion is to buy a 4G LTE data transfer enabled phone like the Samsung Galaxy Note II so at least you’ll have more reliable access to mobile data when working in a 4G LTE enabled area. How long this solution lasts is anyone’s guess but as more people get 4G capable phones, tablets and hotspots this currently speedy digital motorway will likely become similar to it’s congested traffic prone 3G cousin. Samsung seems to have paused innovation in their smartphone camera hardware for a while, with little change in the last year. The Note 2 has an 8 megapixel back camera and 1.9 megapixel front camera for webcam use. During our testing photo and video quality were quite good, with composition and playback obviously aided by the large screen. Should you wish to transfer data to or from the Note 2 there are a myriad of connectivity options including Bluetooth® v 4.0 (Apt-X) LE, USB 2.0 Host, WiFi 802.11 a/b/g/n (2.4 & 5 GHz), Wi-Fi HT40, Wi-Fi Direct, WiFi Hotspot, NFC, S Beam and DLNA (Samsung AllShare Play & Control). Processor capability and temporary memory have been boosted in the Note 2 with a Quad-core 1.6 GHz Cortex-A9 CPU and 2GB of RAM that allow multi tasking several demanding applications with ease. Onboard storage for Australian models is 16GB with expansion possible via a microSD card upto 64GB in size. Overseas models of the Note II have variants with 16/32/64GB storage onboard and it would be good if Australia’s mobile carriers offered these choices. 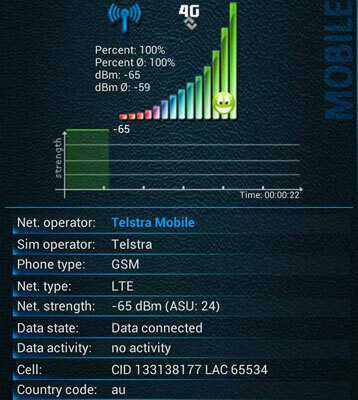 The Note 2 supports HD Voice if you’re on the Telstra network and are calling another Telstra user with an HD Voice capable phone such as the iPhone 5, Galaxy SIII, HTC One XL and Galaxy Nexus. We could clearly tell the difference in quality when we made an HD Voice call using the Note 2. 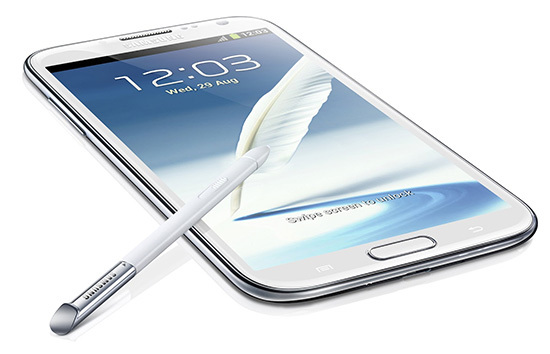 The Samsung Galaxy Note 2 is available on plans through Telstra, Optus, Vodafone as well as outright through grey importers like Mobicity. Note that if you buy it outright and want to take advantage of 4G data speeds make sure you get the GT-7105 model which supports LTE, the cheaper GT-7100 model only supports 3G data speeds. 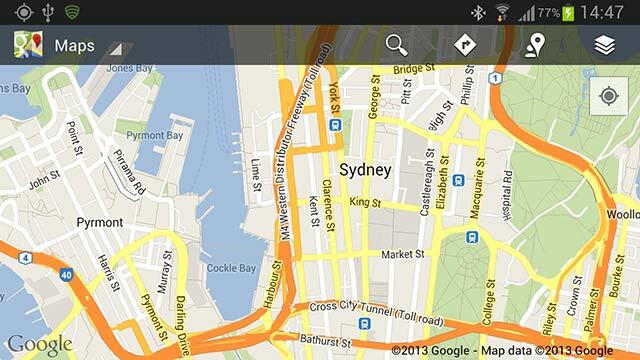 At the moment there are only two 4G networks in Australia, with Telstra’s coverage being far larger than Optus offers.